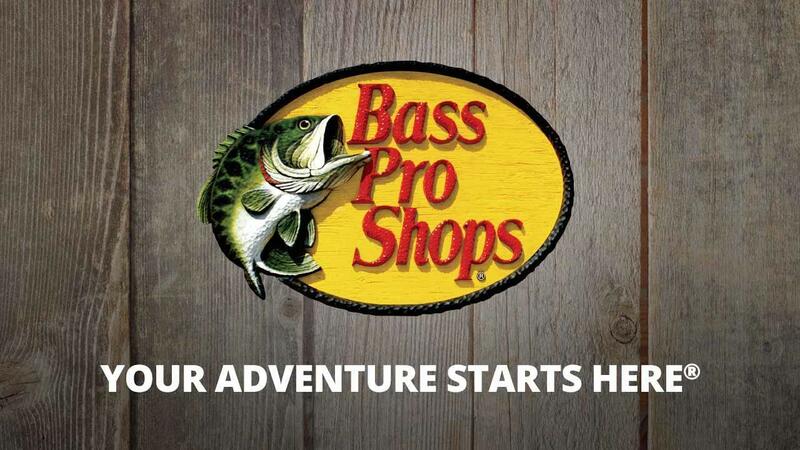 It's time to hop on down the Bunny Trail to Bass Pro Shops! 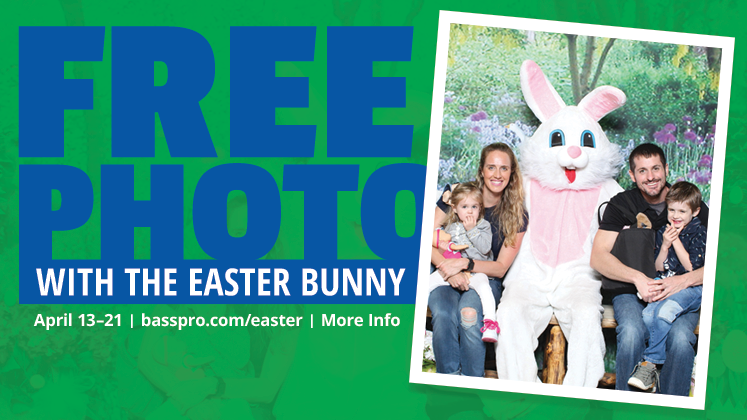 On April 20 from 11 to 6 pm, we will have our photo packages available as well as crafts and an Easter Egg Hunt! The Bunny will be here from 11am to 6 pm. Craft this weekend will be the Standing Bunny. Craft Times are today from 12-5 pm. The Easter Egg Hunt will be from 2 pm - 3 pm, with registration starting at 1:30 pm. It's time to hop on down the Bunny Trail at Bass Pro Shops! We will have our photo packages as well as crafts today. The Bunny will be here from 12-5 pm today. The Craft is the Standing Bunny. Craft times are 12-4 pm. Whether you are here to outfit your next extreme hunting and fishing adventure, or just looking for the perfect gift for the special person in your life, this is the place to be. 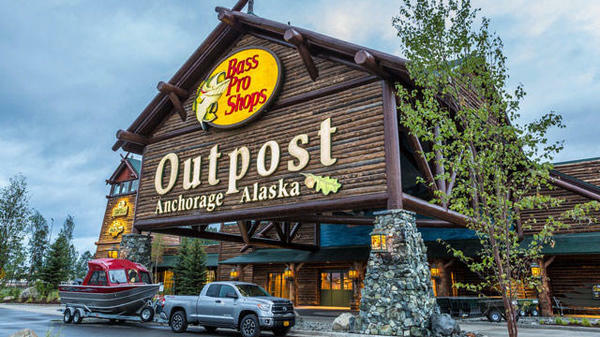 Situated among some of the most beautiful and awe inspiring land in America, our Alaskan Outpost is a testament to the pioneering spirit of Alaskans and Bass Pro Shops. We are second to none for jaw dropping dioramas representing the wildlife of The Great Land, engaged in terrific depictions of harrowing danger and jaw dropping scenery. Local muralist Susan Watkins, and talented Bass Pro staff, have hand painted every surface to show off the glories of the great land. Even the grasses were harvested from our onsite green belt. We boast an 11,000 gallon freshwater aquarium filled with local species, some of which were caught by our talented staff. Marvel at the size of the Arctic Char, and the flash of the land locked King Salmon Alaska is famous for. You don’t want to miss the Dolly Varden, Lake Trout, and Rainbow Trout. Look out though; the tank is protected by a fierce Alaskan Brown Bear and one of five Polar Bears in house! Join us for our regular feedings at 2PM. The Fishing department is not to be missed, especially the White River Fly Shop. Designed to look like a Southeast Alaska Native gathering structure, its prominent feature is an unbelievable Sitka Spruce tree meant to be walked through! Inside you will find everything to catch that trophy grayling or salmon. The experienced staff is there to offer tips and advice from fishing streams and rivers, to setting up a downrigger and tackle. In our hunting department, you will get lost among the carefully chosen selection of items from Alaskan made fillet knives and an impressive array of rifles, shot guns and pistols. Don’t forget the cleaning kits and protective cases for home and travel. Before you head out, be sure to check in with the customer relations staff to purchase your hunting and fishing licenses, big game tags for residents and non-residents and to pick up a copy of the current regulations books. Our murals even reach into our stunning 30 yard archery range, where you can try out the newest products or just tighten your groups up for the hunt. Chat with our skilled technicians, known nationwide for their knowledge and top notch skills in the field and on the range. All ages and skill levels are welcome to pick up new skills and become better archers. The camping department has everything you need for your next adventure into the wild, ranging from a wide variety of freeze dried foods and the all-important insect repellent. Heaters, batteries, hammocks, tents and sleeping bags will make your trip comfortable and memorable. When you get back from that successful hunt, find all of your processing needs here including the reliable Red Head line of products and equipment. The apparel departments will supply you with garments for everything from hunting, fishing, casual and even business casual items. The footwear department will complete your ensemble with the latest fashions and technology. We offer top brands like Natural Reflections, RedHead, Columbia, and Carhartt. If a shiny new boat is in your future, you will have a hard time choosing between all the terrific choices in our Tracker Boat Center. We offer the latest and greatest in river, lake and deep sea options from Tracker, Mako, Sun Tracker, Tahoe and Thunder Jet. Our certified salesmen will guide you through choosing models and motors. You will rest easy knowing that all warranty work can be done on site by our Mercury Certified Technicians. 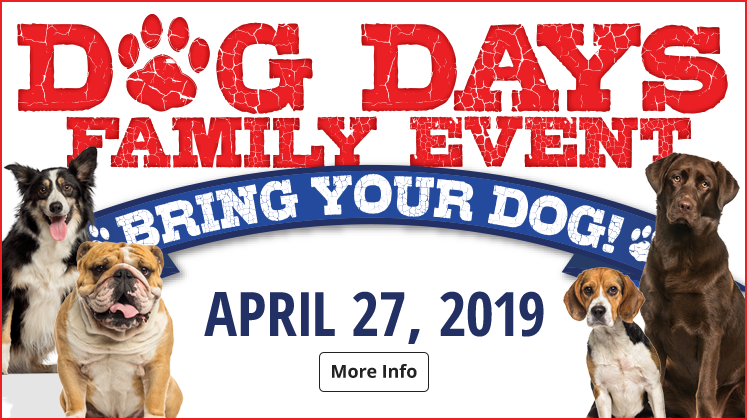 Throughout the year you can take advantage of our special events like our Spring Fishing Classic, Fall Hunting Classic, Easter egg hunts, Trick-or-Treating, Second Amendment days, and Santa’s Wonderland.